The logo and concept of the Widows Sons Masonic Motorcycle Riders Association, Intl was conceived by Bro. Carl Davenport from Chicago, IL. One rainy Sunday morning, Bro. Carl awoke with the words Widows Sons deeply implanted in his head. The words revolved in his thoughts for several weeks and eventually coalesced into the image of a beautiful woman with a pale look on her face. He immediately knew the look was from fear and severe pain. The image kept coming into his thoughts at different times during those weeks allowing him to understand she was a beautiful woman who was having deep problems, but he was unable to see exactly what she looked like or who she was. Only an ashen faced beautiful woman too distant to see clearly. 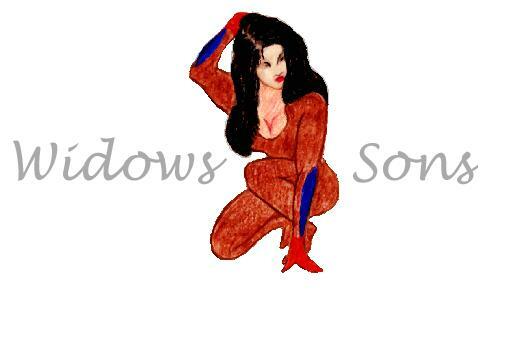 For several weeks he walked around with this image in his head and the words Widows Sons. The image and words revolved around in his thoughts each night before going to sleep. The image would not come in clearly enough to make it out completely, but it was ever present, while he slept, while he rode his motorcycle and at various times during the day. The image then slowly became more clear and its meaning slowly revealed itself to him. The beautiful woman was a widow, her face pale and strained with hurt and fear because of her loss and the uncertainty of her future. Bro. Carl then started to research information on the Widows Son. As he thought more and drew on his Masonic experiences he understood what the image represented. When a Master Mason is called to the Grand Lodge above, his widow always has a deep look of pain and at the same time is full of fear because of the unknown journey she will now undertake alone. She was obviously the Widow. And he decided she was the widow of a Master Mason because of his affinity for the Fraternity. He then spent untold hours trying to put the image he had seen on paper. All he understood at that time was that he should transfer this image onto paper along with the words Widows Sons. Bro. Carl had always wanted to form a Masonic motorcycle riders association. He thought it would carry well across the fraternity. And during this period he had started to put together a list on interested Brethren through the Masonic Biker website on www.MasterMason.com. He very soon had a list of Masons and Masonic clubs listed. Everything was now in place for the forming of the Widows Sons Motorcycle Riders Association, Intl although Bro. Carl did not yet realize it. One day he was having a conversation with a fellow Brother from the Philippines and discussing motorcycles and Masonry and how Grand Lodges might view Masonic motorcycle associations. They decided they needed two things numbers (members) and a cause. It was at that moment that the entire concept including the logo came together in his head. The motorcycle association should be called the Widows Sons and they should aid and assist the widows of Masons whose faces were pale white from the pain of their loss and the fear of their future travels alone. At that point all confusion as to why the words Widows Sons and the image of the widow had come to him. Since that day the Widows Sons Motorcycle Riders Association, Intl has grown with chapters active and forming in several states in the U.S. and countries outside the U.S. The association is open to Masons who ride a motorcycle of 500 c.c. or larger and are in good standing in the records of their blue lodge (AF&AM or F&AM).